ZoneAlarm Extreme Security - download in one click. Virus free. by Zone Labs, L.L.C. & Check Point Software Technologies, Inc.
Download the latest version of ZoneAlarm Extreme Security with just one click, without registration. It comes with a safe official web installer for Windows. 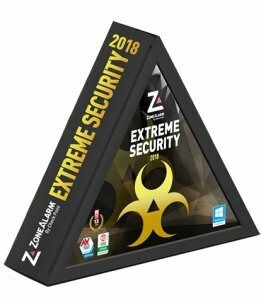 ZoneAlarm Extreme Security is a security program with an extensive set of features meant to protect your computer or mobile device from any possible threat. It also has additional functionality to keep your data secure and your identity safe. First of all, ZoneAlarm Extreme Security works as a powerful antivirus. It protects your system from a variety of known cyber threats, such as phishing programs, viruses, trojans, worms, spyware. ZoneAlarm Extreme Security is effective against zero-day attacks, too, as it analyzes all suspicious files in the real time before any malicious program can act. It also has a customizable schedule of full scans, so you can set up the security of the system to your preferences. 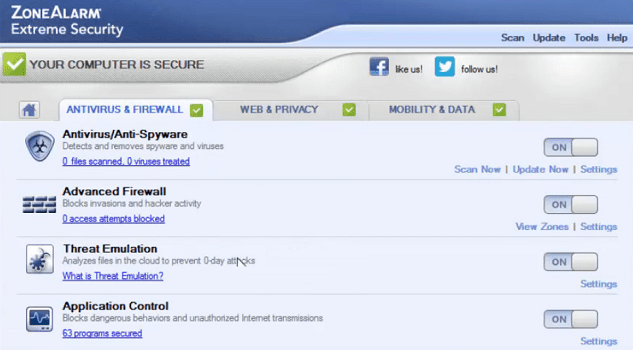 In addition to the antivirus feature, ZoneAlarm Extreme Security provides a two-way firewall that guards your PC against Internet attacks and stops programs trying to send away your data. The firewall will monitor all programs for suspicious behavior, stop new attacks, including the advanced ones, and an additional application control program will keep your system safe during start-up. 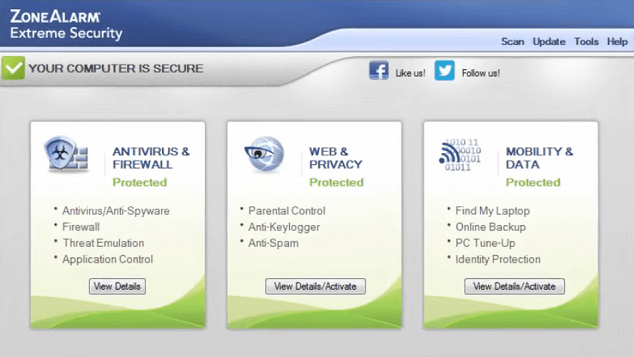 Then, ZoneAlarm Extreme Security protects you on the Internet by protecting your browser from unauthorized scripts and dangerous web pages, blocking any detected keyloggers, and providing you the complete privacy of your actions in the Web. It also includes identity protection service and backup options with automatic scheduling. All in all, ZoneAlarm Extreme Security is a reliable and useful set of programs that covers all everyday security needs. And it has a user interface that is easy to work with, the developers provide full and free customer support 24/7, so ZoneAlarm Extreme Security is a good choice even for beginners and users not interested in all the tech details. Developer: Zone Labs, L.L.C. & Check Point Software Technologies, Inc.